I remember the first time Eugenia Yip caught my eye. This is what I wrote in a live review in TODAY, a few years back. Riot !n Magenta is a relatively new duo consisting of singer/songwriter Eugenia Yip and keyboardist/producer Hayashida Ken and proved to be a totally different proposition. Yip is a dynamic soulful vocalist and managed to coax members of the audience to come to the front of the stage to groove to Ken’s contemporary-sounding beats. What the songs lacked in terms of conventional tunes, Yip make the most of with the range of her voice and her sultry on-stage persona. Certainly, the duo holds much promise for the future. 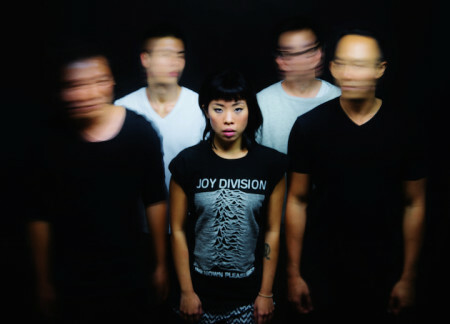 Now a quintet, Riot !n Magenta have a new EP out – Voices (I reviewed it here) – and will be playing at the So Happy: 50 Years of Singapore Rock exhibition opening at the Substation Theatre on the 8th April alongside The Oddfellows and Pinholes. Are the new songs about relationships? Even damaged ones? They’re mostly about personal realizations, or things I experience and feel for very strongly. I wrote “Voices”, inspired by the strength of three women I look up to very much. Nothing inspires me more than the giving of unconditional love, even through the toughest of times. The new songs are a little darker, a little older. “Running” was written about the process of letting go of a past made up of regrets, or even happier times that you struggle to forget, because they tend to remind you of what you’ve lost, but in an insanely more painful way. It is about finding happiness from forgiveness, both given and received. Are they based on personal experience? If so, are they cathartic to perform? The things I write are based on personal experiences, as a first person, or a bystander. It is extremely cathartic to perform them. But I’d have to admit that there is the occasional moment when I find more release in writing them. It’s just something about enshrining that moment of intensity into the written word that makes the entire process a lot more personal and real. How do you juggle between the commitments in R!M and SMQ? It’s been alright so far, the boys are supportive of what I do, and everyone is also part of different projects outside R!M anyway. I find that really awesome because it links the community up very beautifully if you look at it as a movement to push the scene forward as a whole. It does take a little more effort to schedule rehearsals/ gigs, but so far so good. I love all of them to the core of my innermost spirit. When I perform, I enjoy being in the moment of the music and the electric ball of energy that bounces back and forth between each member. I listen to the music and I sing, and I dance. I prance around a lot because it’s difficult not to. I do the thinking when I write, when I’m at rehearsal, or basically at every other time of the day. I think about the message, and the place I’d like to take the story to at a particular moment. My favourite part about singing words that I’ve written, is that I know where each word comes from, it’s intended intensity and the several possible interpretations of it. That gives me endless possibilities to explore vocally and various emotional depths, even after singing it to death for the thousandth time. How do you get yourself in the zone pre-show? I do my warm ups, I drink tons of water, I hang out with my bandmates, I send stupid photos and stickers to my best friend Sarah Tan on Whatsapp and Line. I do the things that make me happy. It really depends on the venue and the type of gig. I used to enjoy lying down in the performance space because it just made me feel at home when I did that. But I have since learnt that doing that gives me rashes sometimes. When I crave being alone, I’d disappear for a tiny while. It really depends. What training did you receive that has been crucial in making you the performer you are? I went to Lasalle College of the Arts, where I did my degree in music, and majored in Voice. I learnt how to understand my instrument better, which to me is very important, because music is my life and I made a conscious choice to make my voice my mode of weapon. I have to understand my weapon. Performing to me is a lot more about getting in touch with your truest spirit and in the midst of it, you set yourself free. I just be me.